Factory Sealed 2014 Topps Allen & Ginter Baseball Hobby Box mit 24 Packs Per Box a 8 Cards Per Pack. 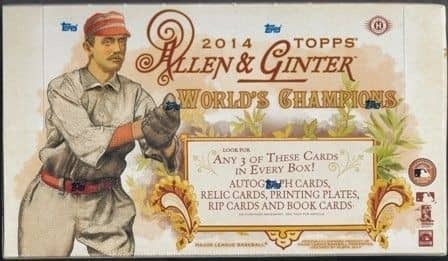 Produktinformationen "2014 Topps Allen & Ginter Baseball Hobby Box MLB"
350 veterans, rookies, retired stars, public figures, and non-baseball champions. The last 50 card numbers are short-printed and inserted 1:2 packs. - Mini Parallel - Original-sized versions of the base cards. - Allen & Ginter Back - Featuring an Allen & Ginter logo back. - Allen & Ginter No Number - Limited to 50. - Allen & Ginter Flag Back - Featuring a specially created parallel back and hand-numbered to 25. Allen & Ginter Autographs Framed mini cards featuring on-card autographs from MLB superstars, both active and retired, and over 30 other athletes, champions, and personalities. Cut Signatures 20 cards featuring authentic cut signatures of political and historical figures. Numbered 1 of 1. Artist's Originals 30 actual, original, 1 of 1 paintings on the mini card, only found in Rip Cards. Allen & Ginter Red Autographs On-card autographs from some of the autograph subjects, signed in red and hand-numbered in red to 10. Allen & Ginter Mini Exclusives 50 cards numbered 351-400 and found only in Rip Cards. These are mini-card variations of players' base cards. Allen & Ginter Mini Wood Exclusives A wood parallel of the mini exclusives. Numbered 1 of 1. NEW! Allen & Ginter Mini Metal Exclusives A metal parallel of the mini exclusives. Numbered. - Famous Firsts - 50 literally one-of-a-kind cards, featuring famous firsts from throughout history. There are no parallels or other versions of these cards - they are truly unique! Numbered 1/1. - Mini Rip Cards - How deep does the rabbit hole go? 20 different Mini Rip Cards can be found inside Double Rip Cards. Inside these Mini Rip Cards are an exclusive mini mini parallel or a redemption for a set of framed mini relic cards! Allen & Ginter Relics Once again, Allen & Ginter will feature three different relic card designs! Two will be framed mini cards featuring relics from over 50 MLB superstars, both active and retired, and all the other athletes and champions; and one will be a standard-sized relic card, featuring more MLB superstars, both active and retired. No box will contain two of the same relic design. Allen & Ginter DNA Relics 4 framed mini cards including a strand of hair from a historical figure. Numbered 1 of 1. Allen & Ginter Oddity Relics Framed relic cards featuring odd and unique relic pieces. NEW! Allen & Ginter Pop Star Relics 10 book cards featuring a relic and a pop-up book style image of a player. Numbered to 25. The Pastime's Pastimes 100 cards focusing on MLB stars and what they enjoy doing away from the diamond. 1:2 packs. All other full-sized inserts are a combined 1:2 packs. The World's Capitals 10 cards featuring the world's most beautiful capitol cities. Air Supremacy 20 cards featuring marvels of aviation technology. Fields of Yore 10 cards celebrating stadiums of the past. Natural Wonder 20 cards celebrating some of the world's most unique locales. Festivals and Fairs 10 cards recognizing some of the most well-known festivals from cultures around the world. Overall insertion rate for mini inserts is 1:5 packs. Into the Unknown 15 cards celebrating great explorers. World's Deadliest Predators 21 cards featuring the deadliest creatures on the planet. Where Nature Ends 25 cards recognizing some of the greatest artists in history. Larger Than Life 10 cards featuring legendary figures and folk heroes. Little Lions 15 cards featuring man's other best friend - cats. - Box Loader Inserts - An all-new style for the box loader inserts. - Box Loader Relics - Hand numbered to 25. - Box Loader Autographs - Hand numbered to 15. - Box Loader Autographed Relics - Hand numbered to 5. - Box Loader Cut Signatures - Hand numbered 1/1. Landmarks and Monuments Cabinet Box Loaders Cabinet-sized cards featuring stunning sites from around the world. Over-sized Reprints Cabinet Box Loaders Cabinet-sized cards featuring reprints of 10 superstars' base cards. Cabinet Relics 10 cabinet-card-sized box loaders featuring relics you can't find anywhere else - full jersey pieces featuring player's name or number. Numbered 1 of 1. Cabinet Book Relics 10 more cabinet-card-sized box loaders featuring relics you can't find anywhere else - full jersey pieces featuring player's name or number - and this time they're book cards, featuring two full relics! Numbered 1 of 1. NEW! Mini Parallel Pack New for 2014, an exclusive mini pack featuring red mini parallel cards of the full base set sequentially numbered to 50, as well as randomly inserted redemptions for a full set of one of the framed mini relic sets! 1 per case. Weiterführende Links zu "2014 Topps Allen & Ginter Baseball Hobby Box MLB"
Fanbewertungen für "2014 Topps Allen & Ginter Baseball Hobby Box MLB"